Great job on the seats ... they look excellent. And great job on the post. thank you. Thanks for posting all information and the great photos! Very helpful and informative. hey Garvino are we related? I wanted to point out a red immaculate Pantera for sale at fantasy junction in northern Cali. Seems to be very original and a preL. Hey guys... has anyone tried using a 71-73 Mustang seat? They sit quite low and have a thin back. There are now some cool aftermarket seat cover options for them, which wouldn't require high dollar upholstery work. I do like the looks of the aftermarket seat skins that you posted. It would be interesting to see if the 71 to 73 Mustang seats would fit (height & width wise). As Jack (Bosswrench) already pointed out, reupholstered stock seats can be quite comfortable. 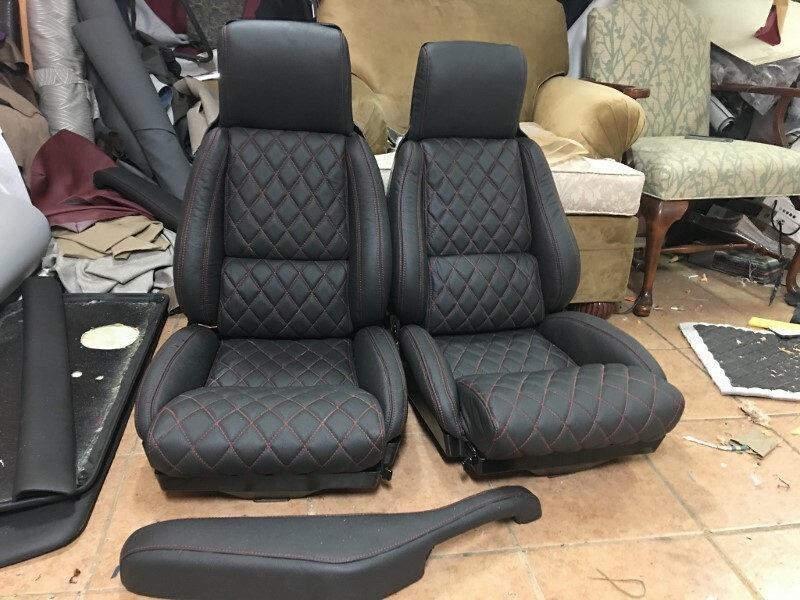 So save yourself a ton of time, effort and re-engineering to make something that doesn't belong fit, and spend that same money (or less) on a quality re-upholstery of your stock seats. Your bottom and your wallet will thank you! Hi Garth, points are all legit. I have a very nice stock set....just looking for a different/custom look. If the stang seats don't work...they will likely be going in. I have a very nice stock set....just looking for a different/custom look. If the stang seats don't work...they will likely be going in. On the subject of seats, I have '69 Mach 1 seats in my 66 GT fastback - they provide a lot more support than the original Mustang low-backs and look like they belong. The stock seats fit into the car the best. The original vinyl upholstery is actually what makes them uncomfortable although thinking about it, the Euro cars with the leather in the same pattern are just as uncomfortable. Maybe it's just the original foam that is the problem? I don't know? The ones that Hall does with leather and new foam make them very comfortable. The Pantera cabin is so tight that virtually any seat other than the stock one causes an issues in another place. The way you have to slide in and out, the seats with the side bolsters just make it more difficult, impossible to move your hips which you need to do and the high backs with the built in head rests block your view. It is amazing how this car just punishes certain body types. If you are built like an NFL middle linebacker, the soft stock seats are by far the best fit but if you start to play with lowered floor pans and pedal spacing the couple of inches here and there are amazing. In my case I have an adjustable steering wheel height on the column and a quick release steering wheel hub too. Those "little" changes transform the cabin immensely but then gives you other seat options. In fact you can actually put a real non-deformed human in the passenger seat if you go to a flat or reduced engine bubble. Why those weren't demanded by Ford back when is beyond me. Seems like some kind of a 'pay back' thing that was going on? Did they loose in soccer or something? My advice would be to stick to a plan rather than try alternatives constantly. I would also say that 'race seats' are not the way to go in this car for the street. Quick update: 71-73 Mustang high back seats do NOT work. They are too wide. I have installed the stock seats. Is that the King Ranch interior? Looks great!! 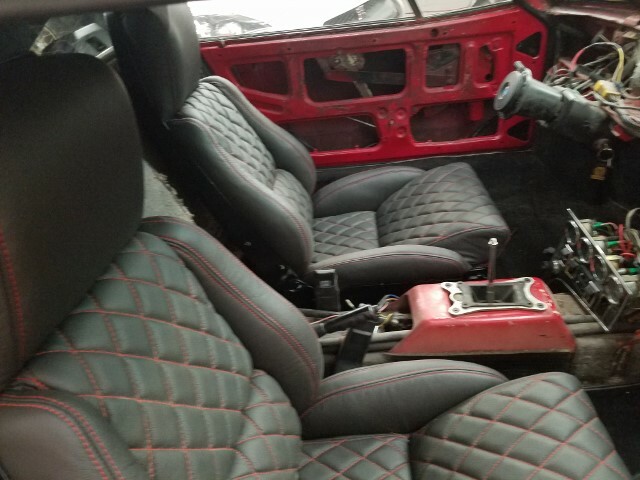 Has anyone ever tried the Ferrari Daytona seats in the Pantera? I was a passenger in a Mercedes SLK 230 recently. I thought the seats might make for good transplants for the Pantera. They are thin, narrow, sturdy, well padded, trimmed in leather, they have side bolsters, and they have adjustable head rests. The mounting base may be a little high, hard to tell unless you try fitting one in the Pantera. I don't know how easily they separate from the Mercedes mounting base either, as its hidden behind decorative plastic. Here's another set of old Recaro seats. They've been in my Pantera since the mid 80's, and just reupholstered in leather. Italian-S, I worked on a '73 Pantera that came with Ferrari Boxer seats but not installed. Worst setup I've ever gotten snagged in. They are too wide- enough that I had to remove the stock seat belts, retractors and plates in the rockers and substitute 3" 'racing' belts which were already sort-of-installed. The setup obsoleted the stock shoulder harnesses but Hall over-the-shoulder harnesses were included. The attach bar did not fit & the special stock bolts were missing..... I made thin sheet metal covers for the rocker panels & used flat-head metric screws for clearance. 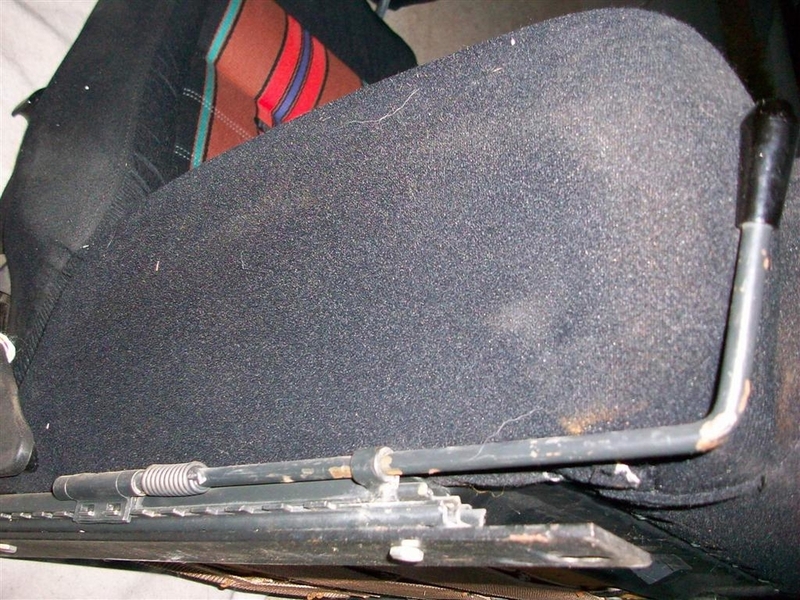 The recliner knobs still interfered so they needed to be removed and a large bevel cut on each knob's periphery to clear stock rocker panel upholstery. The fore-&-aft adjusters were at floor-mat height so they needed careful S-bending to clear stock mats, and since F-cars do not use rollers in their adjustment rails but flat poly sliders, actually moving the seats back & forth was still a two-person effort with someone in a seat. If I'd had ANY other seats available, I would have gladly used them & junked these F-car seats. About the only good thing was, they were high quality leather.... Maybe Daytona seats are narrower & would work better but I would NOT recommend early Ferrari seats like this car had under any circumstances, unless you plan on a pro totally reupholstering the car. Measure VERY carefully- Pantera cabins are narrow! Can someone tell me if these are the original seat track style? This is on a Recaro, which I don't like, and want to put in a set of Herrig's Corvette seats.....but I don't like those in cloth....! BUT it would appear to me that the flat stock that is on this track is not stock????? Those are a similar style but non original Pantera seat tracks. In a Pantera, the best seat to use IS a PANTERA seat. The weakness of them is the STOCK track system. 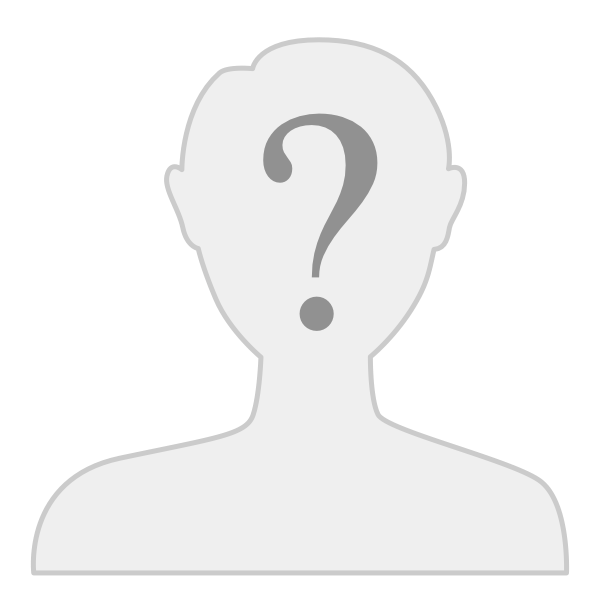 If your car is a one person driver car then even those are sufficient. IF you happen to have lowered floor pans, I would recommend using Corvette power seat platforms. They will give you the simple option of moving around on long trips. It would seem though that the strength of this masochistic tendency of some owners to deny these simple facts, should be left to run it's course in order to prevent violent retaliation against innocents and foster public safety. It just seems so obvious to me though that the Pantera at times seems to be a poster child for contraries and anti-establishment themes? It's like a magnet for them? Yikes! In my case....I got a car....with Recaros in the car, Corvette seats outtada car, and no Pantera seats......! You can get a nice set from Hall. Sell the other seats. Sometimes the obvious answer IS the correct one. 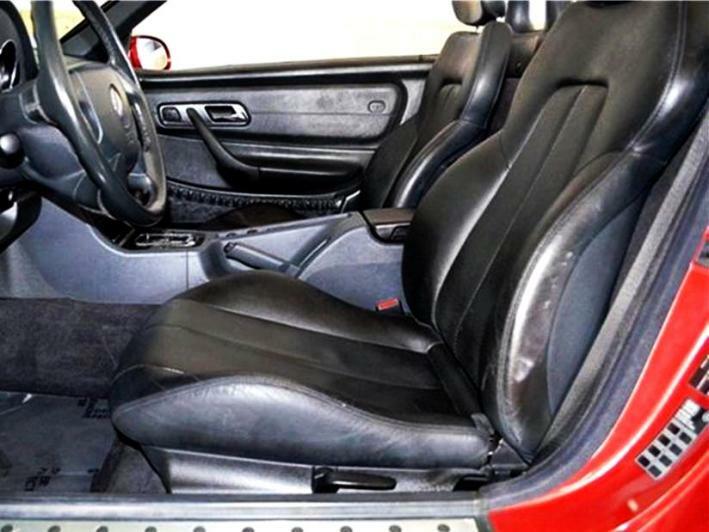 Neither Recaros or Corvette seats are going to raise either the comfort level, the function or the resale value. Quite the contrary. There is always going to be someone who needs to wear a plaid flannel suit to a black tie function. I get that...but why? I have a set Porsche 996 turbo (911) power seats. I tried to put one in my Pantera for kicks and giggles since I had them out of my 911 for some interior upgrades. It looked good but would not work for me without dropped floor pans. My head hit the headliner. I am sure the electric portion of the seats eats up a lot of height space. I will throw it back in and snap a photo the next time I make it to my shop. I'm guessing that i'm headed for dropped pans. I will probably strip the electric mechanicals out so I can sit it as low as possible. Steve, the 'Vette seats and the Recaros-by-Porsche are good trading material to those who are never satisfied. All the vendors will be interested in swapping for stock. #2- You do NOT want the '73-'74 seats intended for your Pantera. The bases & backs are welded into one piece and nearly always crack the frames after a few years. '71-'72 seats with removable backs are stronger and give you the option of adjusting back-rake on the road if desired with 5 minutes of hacksaw work. Porsche 996 (911) turbo seats - power. This seat is slid forward and raked back so that I could sit in it. However, in this position I feel really close to the dash. Likewise, if I move the base of the seat towards the fire wall, giving me more leg room, then my head hit the roof. 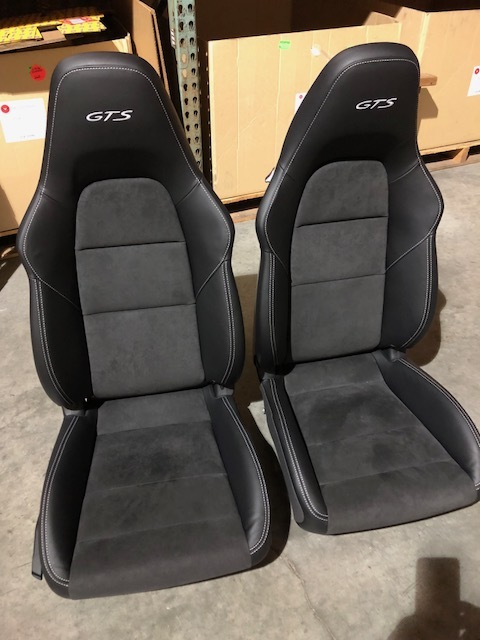 I would be interested to see if a set of non-powered 911 seats would fit. The power platforms seem to vary on how much room they take up. 1" is about the minimum and the trucks are way up there. The Corvette power platforms are about the most compact that you can find off of the shelf. I used Ford Taurus platforms which I thought were more compact BUT I did do a lot of cutting and refitting of them to the new floor pan pattern. They were not just a simple bolt in. I can't speak for the Porches, but my Audi TT has power platforms and the car has a lot of head room built into it. I'm using Hall's Pantera seats with 2" lowered floor pans. If anything, there is too much room. The saving grace is that these platforms also provide for raising or lowering the seat as well as forward/rearward, rake adjustment and power lumbar adjustment. Lots of people ignore these as an option because they are the only one who drives the car BUT the cabin of the Pantera is tight. If you are going to drive it for more than a couple of hours it's nice to be able to readjust yourself every so often effortlessly. The power platforms allow this to happen. I have Hall's recovered Pantera seats that they supply with a manually inflatable lumbar support. It is easily attached to the power lumbar pump in the seat rail assembly. I'm not sure why so many folks need to go through this, "what seat will fit in the car" deal at all? Put a Pantera seat in and the thing fits besides Halls being covered in a nice leather and they are very comfortable as well as opposed to the rock hard original vinyl covers and foams? In any case, I do not think there is enough head room in the car to use a power seat platform without lowering the floor pans? That I never tried. Some time after 1975, Detomaso installed lowered pans in all of the cars as a matter of course. It's just the USA cars that are cramped for head room. Hi Craig, I have a customer that wants different seats in an early car. 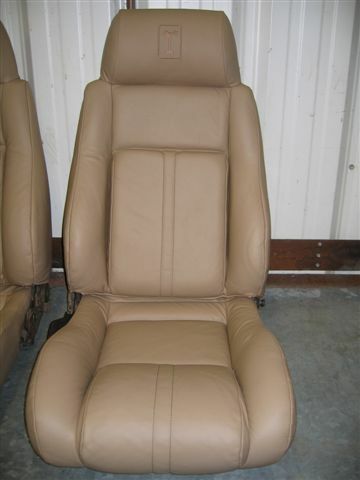 We've used the Pontiac Fiero seat recovered in logo material, but having trouble finding Fiero seats as of late. My customer has had hip surgery. He has difficulty getting into driving position, a very slow process. What he really needs is an effective seat back that allows him to get his back where it needs to be, and of course a seat with tracks [which Fiero does not allow] we bolt 'em to the floor. Do you think your seats would fit the bill? What model are they?? Thanks much. I may have an extra set of Fiero seats. Like these, right? I have recently purchased and re-upholstered a set of C-4 Corvette seats which are readily available on ebay. They fit in the Pantera and when I get the car back next week, I can send pictures of them in the car. Attached are what they look like out of the car after the upholstery was done in black leather with red diamond stitching. 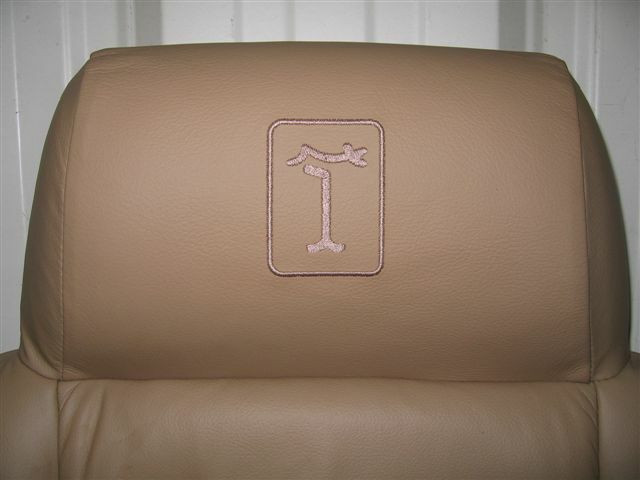 When there is somebody into Europe who want those Fiero seats , I have a set whit the DT logo . Seats are pulled out of Pantera # 4737. Still waiting for car interior to be finished, but do have an attached picture of the seats just sitting inside.